Brazil, Holland, Argentina (definitely not England): there are many dream teams in the World Cup, but few can compare with the line-up Penguin Classics came up with for their edition of a popular Japanese classic. Sanshiro, written by the ‘Japanese Dickens’, Natsume Soseki, is a wonderful Bildungsroman and would be worth the money all by itself. However, when it’s also translated by Jay Rubin, the man who brings Haruki Murakami’s works to the English-speaking world (and who has written a book on Murakami), that just makes it a little more special. And just when you think it can’t get any better, who do you think Penguin have engaged to write the introduction? None other than Murakami himself. Now that is a team worth watching (or reading). As Murakami remarks in his introduction, while this is a Bildungsroman, it’s very different to the European style novel. In the typical Bildungsroman, a young man enters public life, usually in the big city, and undergoes a series of trials, be they emotional, romantic financial or violent. By the end of the novel, the hero has successfully weathered the storm and has emerged older and wiser, a mature member of society. However, this active progression towards becoming a fully-rounded citizen does not describe Sanshiro’s journey; his path is characterised by indecision and procrastination, his trials subtle and confusing. It’s also doubtful that he learns much from his experiences at all, appearing almost as naive at the end of the novel as he is at the start. Sanshiro is a dreamer, and his path through the book can be compared to that of the clouds which appear periodically. He drifts aimlessly through his studies, picking up friends as he goes without actually appearing to know what he is doing or what he wants. You may say he’s a dreamer (and he’s definitely not the only one, surrounded as he is by a bachelor teacher, a hermit PhD student, and a classmate who builds magnificent castles in the air on an hourly basis), but the whole book appears a little dreamlike; the social circle he finds himself a part of is almost like a little bubble, protecting (or keeping) him from the big, bad outside world. This familiar circle of friends (similar to Mr. Sneaze’s circle in I am a Cat) leads one to think that there are autobiographical elements to this book, and Rubin confirms this in his introduction. The story involving a campaign to introduce a Japanese professor to the university mirrors the real life events around Natsume’s start at Tokyo University (although in reality he was the interloper, brought in to replace a popular – and eccentric – American professor). What’s more, the title character was apparently based on a protege of Natsume’s who, like Sanshiro, also came from the far-flung provinces of Kyushu. This book really is a joy to read, at once familiar and yet just different enough from its western equivalents to avoid sinking into cliche. You can just imagine Murakami, sitting in a poky flat, poor, smoking, surrounded by cats, reading Sanshiro and forming the germ of an idea which would one day become a novel. In the introduction to this book he discusses the Bildungsroman, saying “Virtually all novelists have such a work” (p.xxxvi, 2009, Penguin Classics). He goes on to say that his is Norwegian Wood, and while he does not admit to being influenced by Sanshiro in the writing of his most famous book, it’s not difficult to think that there’s an element of truth in this. Good luck to the Blue Samurai over in South Africa; I hope they at least get through to the quarter-finals, surpassing their previous best effort. * However, they would have to pull off something quite spectacular to match up to this (imaginary) literary dream team. Thank you, Jay Rubin; thank you, Haruki Murakami; and thank you, especially, Natsume Soseki. 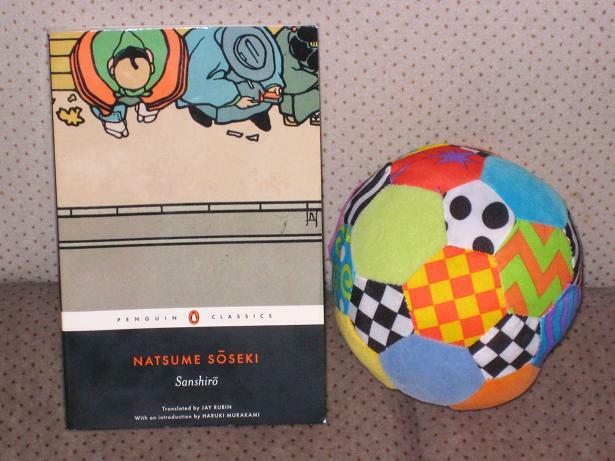 A disappointing result on the football,but thanks for this great post,since reading Kokoro i can't make up my mind which of Natsume's novels to read next i think either this one or And Then. This is on my wish list already but haven't ever read a review on it before, so this is really helpful, thanks! The football result was disappointing, but oh well. At least there's this.. I'm excited about the Murakami connection. Damn, I don't have this one! When I can read again, I'm ordering this immediately. Thanks for the great review! Rooney, Ronaldinho, Cristiano Ronaldo, Cannavaro… the Nike curse is complete (even Federer suffered from it!). This book was a pleasure to read, and the Penguin Classics edition is definitely the one to read it in! This is only my second Natsume Soseki book, but I think he'll be my major author for this JLC. I have my eye on 'Kusamakura' and 'Botchan' to start with, then maybe 'Sorekara' & 'Mon' (although the former is very difficult to obtain cheaply) and moving on to 'Kokoro' once I've read a few of the earlier works. So sad about the Blue Samurais but they did well! I've only read a couple of books by Soseki who hasn't managed to sink a hook into my heart. But I've got 'I am a Cat' on my TBR which I may read this year…not sure yet. I have to say I'm feeling more sorry for Ghana after the way things worked out (and wondering how far Australia would have gone with a similarly easy draw…).